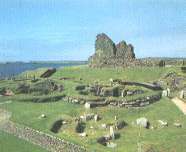 A good example of a broch tower with associated secondary buildings of Iron Age date. A five sided artillery fort, with bastions projecting from each corner. The walls are high and massive. It was built in 1665 to protect the Sound of Bressay from the Dutch, but taken by them and burned in 1673. It was rebuilt in 1781. At Sumburgh Head, 22m S of Lerwick on the A970. An extraordinarily important site with a complex of ancient settlements within three acres. The oldest is a Bronze Age village of oval stone huts. Above this there are an Iron Age broch and wheelhouses, and higher still an entire Viking settlement, medieval farmstead and 16th-century laird's house. Visitor centre and museum. The finest surviving Iron Age broch tower. It stands to a height of over 40 feet. A late 16th century tower house with circular towers at diagonally opposite corners. The northernmost castle in the British Isles, Muness has remarkably fine architectural detail. A defensive stone built blockhouse, probably of Iron Age date, with some features resembling a broch. Access is difficult. A fine castellated mansion built in 1600 by Patrick Stewart, Earl of Orkney, who was notorious for his cruelty. A Neolithic hall, heel-shaped externally, and containing a large oval chamber. Around it are ruins of houses, walls and cairns of the same period.